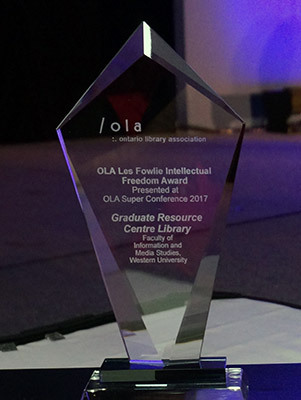 The FIMS Graduate Library has been awarded the Ontario Library Association’s Les Fowlie Intellectual Freedom Award, recognizing them for their work in protecting digital privacy rights and educating students in digital privacy issues, academic freedom, and anti-surveillance technology. 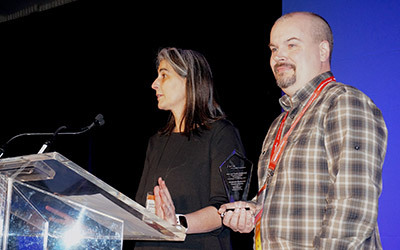 Marni Harrington, FIMS Librarian, and Matt Ward, FIMS Computing Services staff member, were on hand at the OLA Super Conference in Toronto on February 3, 2017, to receive the award. In March 2016, the FIMS Graduate Library, part of the Faculty of Information & Media Studies, was the first library in Canada to set up a Tor relay, contributing to an international network that allows for encrypted Internet browsing. Viewed as an important teaching tool for a faculty that houses graduate programs in library science, health information science, media studies and journalism, this past year has seen the Tor node discussed in workshops, used in demos and act as a launching point for discussing wider issues. A small step practically speaking, it has allowed for wide-ranging discussions on privacy issues that affect everyone. “Graduates from any of our program areas may ultimately work with populations at risk. We want our community to engage with digital privacy and security tools - use them, talk about them, and bring them to their post-graduate jobs and experiences,” explains Harrington. Lindsay Taylor, an MLIS student who has been involved with the FIMS Tor project since its beginning, adds that she’s hoping the award will inspire others to follow suit. Tor technology is not without some controversy, says Matt Ward, who has been assisting with the technical side of the project. He says sometimes people ask why they should be worried about being watched if they aren’t doing anything wrong. But Ward says privacy issues should be of concern to all citizens. Taylor believes that librarians are very well positioned to educate the public and advocate for protections against these types of threats. She notes that despite our dependence on digital technology, many people don’t understand how vulnerable they are to attacks or breaches of trust. She’s hopeful that improving her own digital literacy skills will help her educate others in her future career. Ward, who has participated in numerous talks and panels related to the Tor relay over the last year, says that there’s a high level of interest in the project, from students, scholars and the public. “Our students are really excited about this project, want to learn more and contribute. The Tor relay is an example of a technology that students and professors can see and learn about, the data output and input are on a display in our library so visitors can see the node in action,” he says. The FIMS Tor project may be drawing a lot of attention in part because many people aren’t sure what it is. The Tor relay hosted in the FIMS Graduate Library is just that – a relay point through which digital traffic can flow. Regular Internet traffic bounces from relay point to relay point on its way to its destination. Typically, information flows unencrypted, and is open to surveillance by corporations, governments, spy agencies, or other interested parties. User information can be collected, shared, sold, or otherwise used without your permission. A Tor relay allows encrypted information to pass through, increasing the user’s protection against surveillance. It provides anonymous communications that cannot be traced back to an individual or location. This can be particularly important for people living in nations with oppressive governments, for whom communicating and accessing information can be risky, as well as those who are personally persecuted for their religious beliefs or gender orientation. No data is stored at a Tor relay point like the one operated by the FIMS Graduate Library. It simply allows information to pass through, and contributes to the wider, global Tor network. “For us in FIMS, advocating for free speech and information privacy goes beyond the American Library Association’s code of ethics. I would say that it is integral to the mandate of our faculty,” says Harrington. But she’s hoping that other libraries will take up the cause. For any library interested in participating, Harrington adds that the Library Freedom Project, part of a movement encouraging libraries to take on the responsibility to teach information literacies that include online privacy and security, has many resources and tools available. While a project like this has particular resonance for an academic library, where protecting academic freedom is in the forefront, Harrington hopes that all types of libraries will recognize the value. On February 1, 2017, the ALA updated their privacy guidelines to include exactly that scenario. They are now recommending that libraries install a Tor browser on public computers as an option for patrons. With the use of Tor technology in libraries across North America likely to increase, Taylor believes the educational component becomes even more valuable for students in FIMS.